Editor’s note: This is the first part in our new series of posts covering 2018 flooring trends. Hardwood never goes out of style, and there is a perfect hardwood option for every room in your house. Despite its timeless look, there are trends in how homeowners and designers use hardwood in their homes, and here’s an inspirational and handy guide to what’s going to be hot in 2018. Ebony, walnut, and dark mahogany stains give hardwood floors a deep, luxurious and modern feel. These stains look different depending upon the type of wood they are applied to, so be sure to get a sample of your hardwood flooring type to see what your stain selection looks like—and to check that it has the look you’re going for. For a classic yet fashionable choice, think gray. The less-is-more minimalist color has been popular for floors for a few years because it gives you lots of choices, and the trend of designers and homeowners picking gray is here to stay. 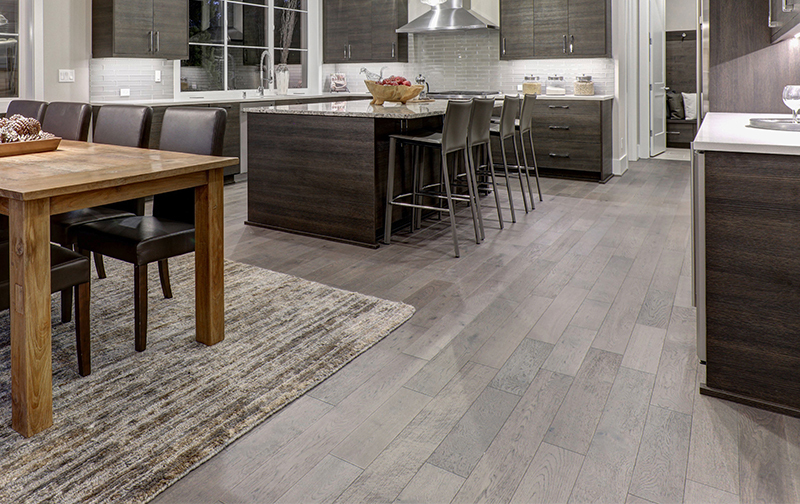 Gray makes a great color for flooring because of its versatility and ability to add texture and interest. As a neutral hue that comes in many shades, there’s a gray for every room, no matter if your preferred style is contemporary or timeless. Get a look that’s rustic or sophisticated with how you add finishing touches to your personal decor. While dark and gray hardwood floors continue to be popular choices in the Indianapolis area, more customers have recently started to explore installing flooring that has a more natural look to get a casual, airy, and comfortable look and feel to a room. Too much natural hardwood sometimes presents a design challenge because it can be tricky to get the right look without creating a “wood overload” feel. But, when they’re done right, this type of floors is aesthetically amazing and emphasizes the natural beauty of hardwood. Exotic hardwoods are an up-and-coming trend. Using exotic, non-traditional flooring such as Brazilian cherry, teak, or tigerwood gives you the timeless feel of hardwood with a splash of something different. This trend can really make your home stand out because exotic woods come in a range of hues, textures, and styles. The newest trend in hardwood has nothing to do with color or wood type. It has to do with plank size. You can achieve a non-traditional look from standard hardwood by changing the size of the planks. Look at wide planks. Five, eight, and even ten-inch planks are available in a variety of wood species and shades. Wider planks lend a real old-world charm to your floor. Make an appointment with one of our designers and start narrowing down which hardwood options will work the best in your home. They will prepare selections in advance for you to consider, and, as with all design consultant services at Kermans, their help is completely free! Want to learn more? Download and read our information-packed hardwood buyer’s guide to help with your decision-making process.